If you live in an area that tends to get extremely hot during the summer, then you most likely appreciate an icy drink every now and then. Nevertheless, constantly putting ice trays in the freezer and waiting for hours on end for a few cubes gets tedious after a while. At this point, buying an ice maker starts sounding like a good idea. The first thing that you need to establish before buying a new ice maker is exactly how much ice your household requires. If you’re not one to add it to your drinks too often, then a simple ice tray will suffice for your purposes. Nevertheless, keep in mind that it takes a long time to make ice in a freezer. Furthermore, this method can lead to ice that is of questionable quality because the freezer is also a place for storing food. Certain odors and tastes can seep into the ice, which will add a funny-tasting tinge to your cocktails, lemonade or tea. Furthermore, you can’t make more than maybe 50 cubes or so at a time, which is detrimental for bigger groups of people. If you’re certain that you need a lot more than that then it’s time to start reading some ice maker reviews and choose what suits your needs best. Here are the four main types of appliances to help your decision. 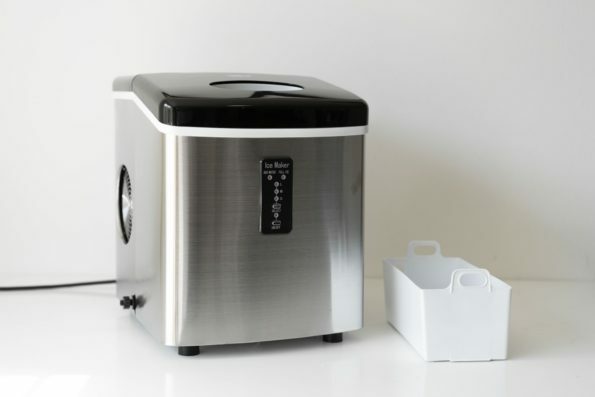 The most common type of ice maker encountered in households all around the world is the portable ice maker. The most notable thing about it is that it makes more ice than a freezer can in a shorter amount of time, usually no more than a few minutes. This ideal if you enjoy a lot of iced drinks together with your friends or family. What is more, if you enjoy throwing parties or putting together large gatherings, such an appliance comes in handy. And because they are portable, as the name implies, they can also be taken on the road for camping trips and vacations or transported to events that are held elsewhere than your house. The equipment is easy to use because all you have to do is pour some water in the machine and turn the power on. This produces high-quality ice that hasn’t been sitting in a freezer surrounded by food for days. And when you’re done with it, it will be simple to choose a location to store it because it’s rather small and space-effective. Some people prefer to have their ice makers built into a counter or some other furniture unit of sorts. This is especially popular with RV or boat enthusiasts who want to enjoy a nice, cold drink during their many trips. But traveling isn’t the only occasion when these are appropriate. They are also an excellent addition to your home bar so that you can entertain your guests as well. These are equally easy to use as the portable ones, and they don’t take up a lot of space either. Furthermore, the majority of the newer models come with an automatic shut-off function that prevents them from producing too much ice. Thus, you don’t need to keep an eye on it at all times because it will do its own thing. All in all, it’s convenient on all fronts. If you’re lucky enough to have a bar in your backyard, installing an outdoor ice maker in it is the perfect finishing touch. Just think of all those time when you’ll be busy barbecuing and could use a cold drink to refresh you. Or imagine relaxing by the pool on a hot summer day with a glass of lemonade filled to the brim with frosty cubes. Furthermore, when you have guests and you choose to stay outside, you won’t have to run back and forth from and to the freezer to get some more ice. And rest assured, the appliance is designed in such a way as to not be harmed by harsher weather conditions, such as low temperatures or rain. The final type to discuss is the commercial ice maker. These are perfect for large catering events, restaurants, pubs and just about any establishment that serves drinks. They are quite large and expensive, but they can produce pounds on top of pounds of ice in a short period of time. However, there is no use for something of this caliber in the average household. Depending on your needs, you can choose between a portable, built-in or outdoor ice maker. Regardless of what your priorities are, one thing is certain: unless you own a restaurant, you won’t be needing a commercial appliance, so just focus on the first three on the list.